1928-31 Model A Ford Amp Meter 20-20 Amp. This is the one to use, if you still have a regular generator. Use the 30-30 version, if you are running an alternator. Comes with rear terminal nuts. Note: Quality on these is not great, but they are the only ones available. 1928-31 Model A Ford Amp Meter 20-20 complete with the Ford Script. 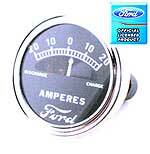 (The original type amp meter used by Ford never had the Ford script, but some customers like the look). Comes with rear terminal nuts. 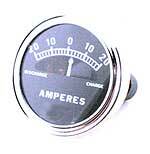 1928-31 Model A Ford Amp Meter 30-30 Amp. 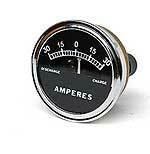 This 30-30 amp version, is ideal, if you are running an alternator. Comes with rear terminal nuts. Amp Meter Nut set 1928-31. These are the insulated nuts for attaching wires to amp meter. Script Amp Plate 1928-31. 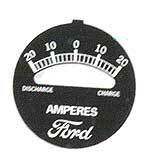 Although not correct, you can add this plate to your repo or original amp meter. Discontinued item. Only a few left. If you have electric guages, this is the electronic voltage reducer for 6v dash guages when converting from 6volt to 12volt. View our oil pressure guage kits in our engine oil pump section! View our temp guage kits in our colling system section!